Just a small town gal and that is all I'll ever be, where life is just another iced sweet tea away, where you can see the twinkling stars at night, the wonders of the moon, and puffy white clouds floating across the blue sky. Welcome to my blog from the heartland, full of random musings, observations. Things I love, events in my life, humor.. Celebrating first day of spring wearing shorts and flip flops! Actually brought out the flip flops during several warm days that cropped up over the last month or so. It is official now, flip flops here to stay until ???? May have a day that won't wear them due to the way the weather flip flops. That is a frequent occurrence in this area. If ya' don't like the weather today, wait a bit, and it'll change. We have had near 80 temps only to find ourselves grabbing the blankets the next day due to below freezing weather. It is a time of reassurance that as much as the world changes, the changing of the seasons remains constant. Spring seems to bring a peace and calm to the land after withstanding the harshness of the winter as it rested in order to bring forth the revival of new life. 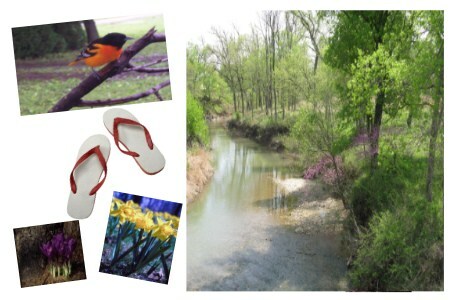 Simple pleasures ......springtime blossoming with the renewal of life all around us and flip flops.